Growing up in church, I always knew the story of Mary- a virgin chosen by God to carry His son. It's a pretty hard story to miss, right? We hear the story every year as the holiday season approaches, and it truly is a great story and one that I have always loved. But to be honest, it wasn't one that I fully grasped until I became a mother myself. I didn't know about both the joys and the hardships that pregnancy took on the body. I didn't know the love that you felt immediately knowing that there was a child growing inside of you. I didn't know the protectiveness that sets in immediately when your little one makes their appearance. Now, knowing what I know about being a mother, this story of Mary is even more astounding. How many would have said yes? Would I? Truly if there was ever an example of someone to look up to when it comes to being a good Christian mom, you could do no better than Mary. After all, who knows better than Christ's mom herself. This is just the topic at hand in Sarah Jakes' new book, Dear Mary. Mary is a remarkable example of a quiet, resilient faith in the face of adversity--from the angel's first announcement of her pregnancy to the death and resurrection of her son. She was witness to our Lord and Savior in a special way, and modern-day moms can learn valuable lessons from her life. 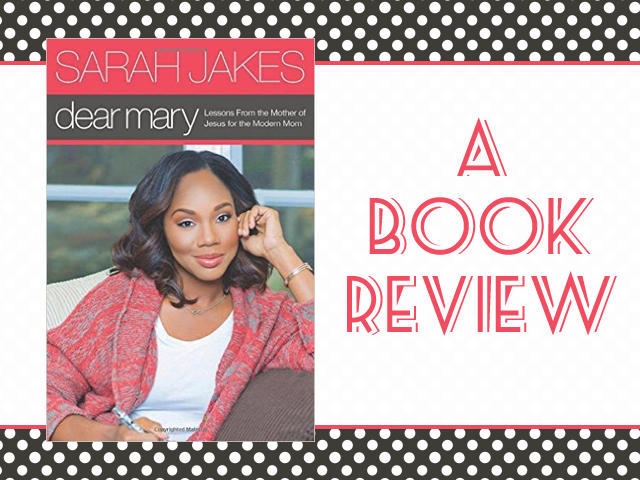 In Dear Mary, Sarah Jakes explores biblical stories about Mary--as well as stories from her own life--to better understand what living for Christ can look like today and how to model that for your children. Maybe you struggle to trust God's will for your life. Or perhaps you have fears and insecurities that keep you from realizing the joy God wants for you. Through the example of Mary, discover the freedom that only true faith can bring, and get a fresh perspective on the amazing love and compassion of Jesus. If you're looking for a great book on Christian motherhood, this truly is a great one to choose. Like I said, there really is no greater example of what it looks like to be a good Christian mom, to trust God fully with our children than Christ's mom. We all know that we should trust God with all things, including our children- but as moms we worry about everything. Mary shows the greatest example of trusting God with your children. She trusted God through her miraculous pregnancy and remained faithful as she watched her son die on the cross...oh, to have that kind of faith! This truly is a great read and one that I highly recommend to every mother. Dear Mary is available to purchase now at your favorite Christian book retailers. This book sounds truly amazing!! I sometimes feel so lost in motherhood and how true is it that we should look up to the greatest mother of all! !